Health Council decisions are made by at least 7 persons from a body of 13-15 Board members. Average comprehensive annual health insurance coverage per person ranges from $441 – $1,500 depending upon age, health status, prior claims, etc. I point out these facts to highlight the enormous task of the Health Council to uphold its mandate. Chief among the concerns is the escalating cost of health insurance and quality health services especially for medium and low income persons and persons without employment. The sad irony of the healthcare dilemma is that Bermuda’s elderly population and those with ongoing health concerns who need health services the most, are also the most adversely impacted by escalating costs. Health services, healthcare professionals and health products operate within a peculiar industry. The usual market forces that determine quality and cost do not apply when life, limb and good health are at stake. People will do or pay whatever it takes to save their lives, regain their good health or to alleviate suffering. Under these circumstances the element of choice is proportionately limited by need or desperation. Furthermore, health professionals fall within the most elite category of professionals requiring years of education and training. Costly equipment and facilities are also often involved. In this context, we have need for a measured regulatory framework to prevent price gorging, dubious standards and to strike the right balance to ensure sufficiently incentivizing competent professionals delivering quality care. Eleven years is not a long time to break with the tradition of operating without accountability to a regulatory body such as the Health Council. It is not a long time for the Health Council to strike the desired equilibrium between quality care and accessibility. Allegations are bound to be made, sometimes sincerely and sometimes to manipulate predictably strong emotions for material gain or to strategically serve personal ambition. My staff and I did not sign up to be slandered, threatened and intimidated but we are bolstered by the need we serve. Like other jurisdictions, we are at breaking point and Bermuda has no choice. If the Health Council does not succeed we will continue with the contradiction of an affluent society where people cannot afford proper medical attention or medicines when literally needed. We have taken the piecemeal route of addressing this very difficult problem. Most other developed countries have universal healthcare that allows all citizens to attend to their medical needs as required, with little or no direct cost. United States is one of the exceptions to this and incidentally has the highest total health expenditure per capita in the world. As usual, those who can afford it, will continue to avail themselves of healthcare whatever the cost. The rest will die from lack of proper medical attention or live with disability or pain to the extent that quality healthcare is beyond reach, thereby affecting their productivity and ultimately Bermuda’s economy. On a final note, I personally have had the privilege to meet with the full range of health service providers on island. My experience has been that they are overwhelmingly of good will consistent with the calling of their vocation. As a health professional with over 15 years’ experience providing direct clinical care, I impute no ill will to anyone. Further, my transition from direct practice to managing an organization that has such an awesome and complex mandate, has not only been rewarding but makes the occupational hazard of inevitable attack worthwhile. I come to work every day for reasons beyond my self-interests such as: For the young 21 year old who told me they cannot afford dialysis; for the amputee needing an artificial limb; for the woman who could not afford medically necessary breast reconstruction; for the man who wanted another option other than removing his prostate; for the person with schizophrenia who was lucid enough to articulate being mistreated; for the senior who runs out of medication and cannot afford more; and for the health professional who is passionate about providing the best care they can in a fair health system. At the same time I recognize the challenge of reconciling conflicting and competing interests and the complicating factor of Bermuda’s small degree of separation between the parties as relates to the business and the demand for healthcare. I end with a thank you to my commendable staff and the many well-wishers who have offered support and encouragement. And to young Mr. Taj Donville-Outerbridge who was reported in the media on 15th March 2018 to have listed being “President of the Bermuda Health Council” as one of his ambitions when he grows up: I could not have asked for a better endorsement at a more opportune time. We owe it to him to make it feasible for him to fulfill his ambition. I will continue to work to achieve the desired outcome for the people of Bermuda, with the help of a supportive staff, to ensure that when the time comes, the Health Council will continue to be worthy of Mr. Donville-Outerbridge’s ambition. 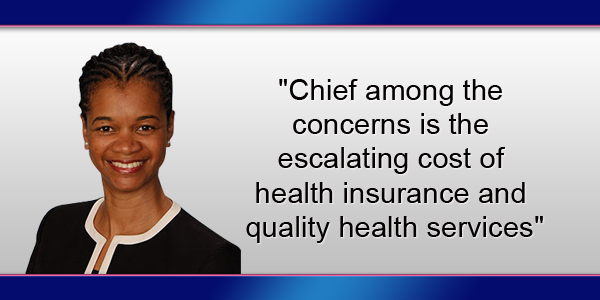 Tawanna Wedderburn is CEO of the Bermuda Health Council, a quasi-autonomous nongovernmental organization tasked with regulating, coordinating and enhancing health services in Bermuda. There have been too many instances recently where the effort to clear up a contentious issue leaves the reader with more questions than answers. This isn’t one of them. Well said and thank you.